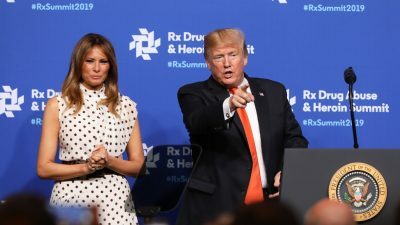 WASHINGTON—President Donald Trump talked about his older brother’s struggle with alcoholism during a speech on America’s opioid crisis on Thursday. “He was substantially older and I listened to him and I respected him,” Trump said. “He would say it over and over and over again. And to this day, I’ve never had [a] drink. And I have no longing, I have no interest in it. Fred died in 1981 at the age of 43. Prevention was one of Trump’s key messages before he signed a declaration to make the opioid crisis a nationwide public health emergency. The president said he thinks the most important thing will be to teach young people not to start taking drugs. “There is nothing desirable about drugs. 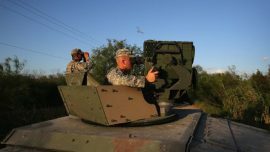 They are bad,” Trump said. But, he said there is also a critical need for treatment. “We understand the need to confront reality—millions of our citizens are already addicted. 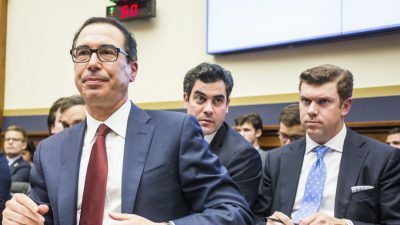 … They are hooked and they are suffering,” Trump said. In 2016, more than 64,000 Americans died of drug overdoses, according to preliminary numbers. The declaration will free up resources to broaden treatment options, as well as stop the overprescription of opioid medication from medical practitioners. Agencies have been tasked with finding alternatives for pain management that are not addictive. 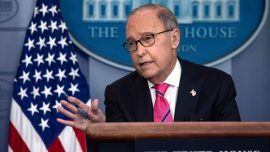 Trump also said that he will request that one “especially high risk” opioid be withdrawn from the market. A White House official confirmed that the drug is Opana Extended Release manufactured by Hogan Gildey. Trump wants to make addiction treatment available in jails as well as amend the current law that doesn’t allow facilities with more than 16 beds to treat drug addiction. The declaration also puts a focus on the illegal drug market. The Department of Homeland Security and the U.S. Postal Service are both tasked with stemming the flow of illicit drugs into the country. 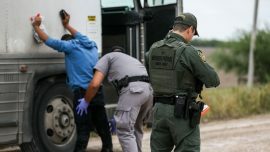 The Department of Justice last week indicted two Chinese nationals for manufacturing and distributing the synthetic opioid fentanyl in America. Fentanyl is 50 times more powerful than heroin and 100 more potent than morphine. Much of the illicit fentanyl in the United States comes from China. Trump said he will mention this to China leader Xi Jinping “as a top priority” when he visits China in a couple of weeks. 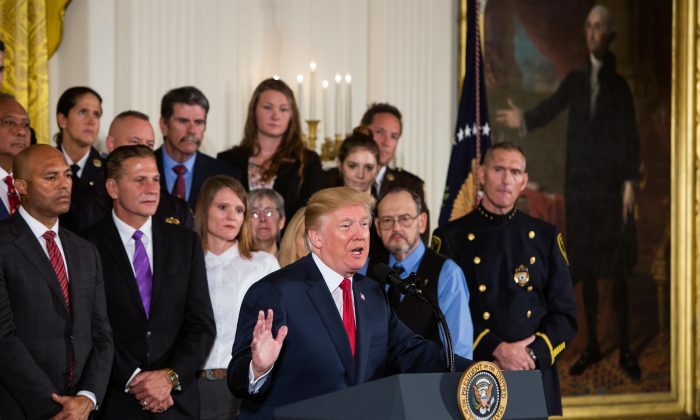 “I want the American people to know that the federal government is aggressively fighting the opioid crisis on all fronts,” he said. 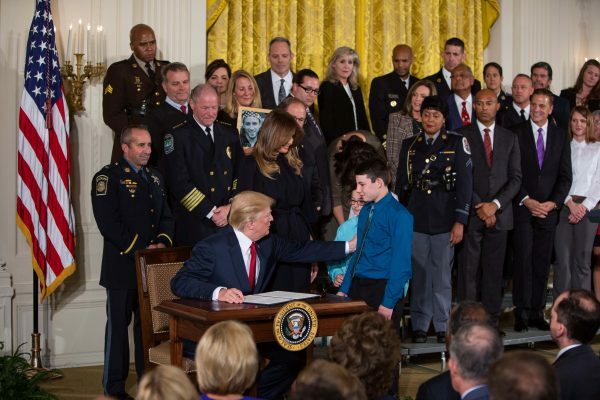 Trump signed the declaration in front of people who had lost loved ones to addiction, individuals in recovery from addiction, first responders, and foster parents to children affected by opioid abuse. 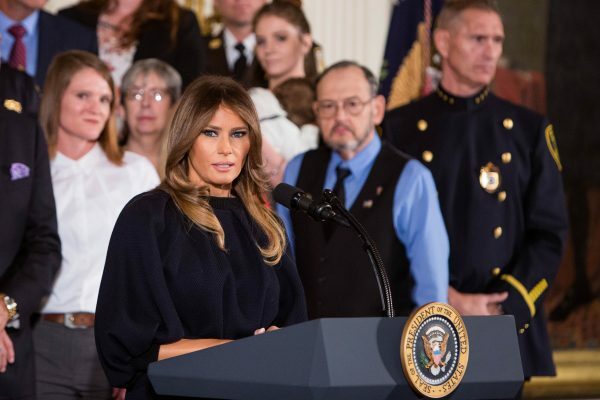 First Lady Melania Trump introduced her husband, saying the opioid crisis is something she has taken a larger interest in recently. Melania Trump said she spoke with a coach whose player became addicted to pain medication after a sports injury. She also spoke to a father whose son started buying opioids online. The son overdosed and died just eight days before his 21st birthday. The common theme is that this can happen to any of us, she said.